Project & Construction Management | O'Connor Construction Management, Inc. Attention to details makes all the difference in advocating for a client’s best interest and promoting the successful completion of a project. Details like becoming the eyes and ears of the client to help mitigate a project’s risk. Or details like ensuring that the project stays within budget and not varying more than a tiny fraction from the original estimate. 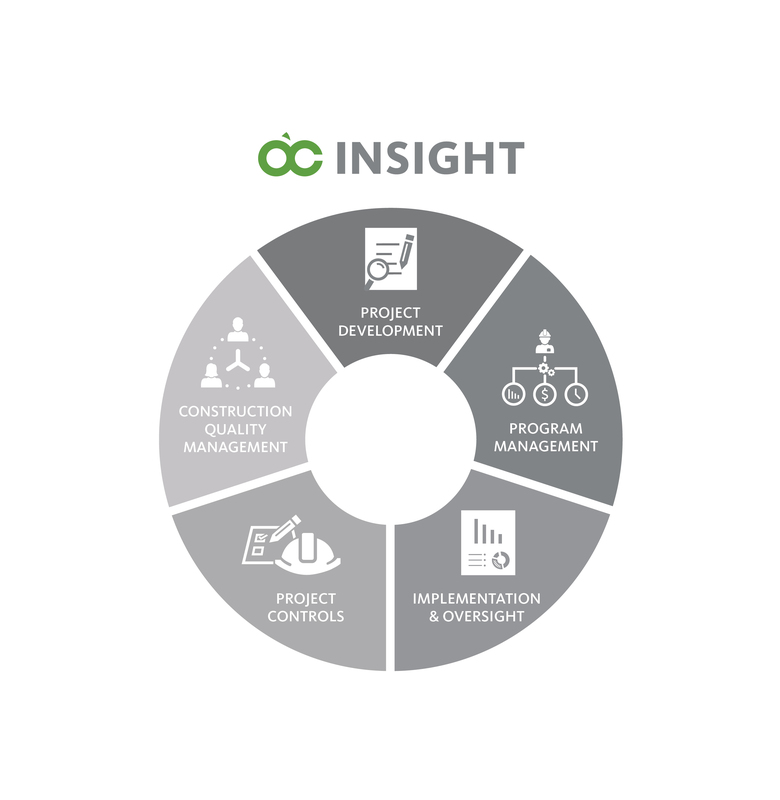 O’C Insight’s comprehensive suite of PM/CM solutions ensures that we cover every aspect of your project, from start to finish. OCMI’s Project and Construction Management professionals are on the job 24/7 job, advocating for your best interest and the success of your project. Advocates and trusted advisers to owners across any market sector, OCMI’s project and construction managers (PM/CM) adopt and value our client’s priorities as our own. We work on your behalf, act proactively to mitigate and prevent risk, and incorporate our best-in-class practices by proposing solutions that turn your project into a success. As your advocates in the field, OCMI’s team members oversee your project’s cost and scheduling, adding value and mitigating risk every step of the way – from pre-planning to post-occupancy. We forecast potential challenges and resolve them, so that you can have peace of mind. We have effectively coordinated teams with as many as 30 people, and each project with a million little details. Our planning approach ensures no detail is overlooked, no matter how minute or complex. OCMI is the top choice for project and construction management. Planning, organizing, coordinating, and controlling a client’s project from the very beginning, OCMI’s expert PM/CM teams start by aligning the right delivery method to a project’s unique challenges and implementation from contract setup, to process mapping and execution. From project inception, we also manage and implement feasibility assessments, design team selection, project budgeting, master program schedules, design management, and on-going oversight of the planning phase. Overseeing and administering several interrelated projects OCMI’s PM/CM teams are skilled and adept at developing comprehensive program management solutions with the objective of improving the process, budget and schedule performance, and execution goals of our client’s project portfolio. When managing and directing a client’s project, OCMI’s PM/CM teams are client advocates and problem solvers. From design and risk management to cost, schedule, and document control, we immerse ourselves into the project throughout each stage of a construction project, quickly gaining an understanding of the challenges that lie ahead. Managing, monitoring and analyzing data to better understand and positively influence a project’s timeline and cost, OCMI’s PM/CM teams work with our in-house schedulers, estimators, and project engineers to harness project data and deliver easy to understand information efficiently. From total systems rollout to dashboarding project health status, we make it easy for our clients to know where their project stands and make critical, real-time project decisions. Managing and verifying quality throughout a project’s performance, OCMI employs experienced Project Inspectors, Inspectors of Record, Special Inspectors, Quality Assurance/Quality Control (QA/QC) and Construction Quality Management (CQM) professionals, who follow established procedures and standard practices to meet regulatory code compliance and our client’s quality requirements and expectations. OCMI's cost control services promote accuracy through market research and data analysis. At OCMI, we view schedule control as the place where timing and costs intersect. Have questions about your next project? OCMI’s team of professionals can help meet your needs and expectations.